SOUTHERN UTAH — As winter draws near and the days grow colder, trees and plants can become at risk of being damaged and community members are urged to take steps to keep their trees alive as temperatures continue to drop. St. George may be popular for its warm climate and low amounts of snow throughout the year, but winter’s damaging effects occasionally reach the Dixie area. 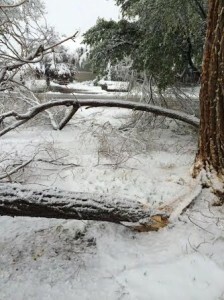 In December 2013, winter storms and cold fronts battered Southern Utah, causing damage and even death to trees not used to those conditions. While the trees may not be able to protect themselves from extreme winter elements, there are certain precautions tree owners can take to prevent similar damage this coming winter, Hodges said. One way to combat the cold temperatures is by using heat lamps, Hodges said. Heat lamps can provide warmer temperatures to the trees, preventing them from experiencing damage from the cold. If the tree is smaller, people can also put a burlap sack over it along with using the lamps. Hodges also said he urges people to ensure the lamps they use do not get too hot and to make sure they are not near anything that could melt or catch on fire. These lamps do not need to be used constantly, Hodges said. The best time to use them is when there is a night of expected low temperatures, especially approaching or including single-digit temperatures. St. George isn’t the only area to experience winter problems with trees. In May, hundreds of trees in Cedar City were damaged following an unexpected snowstorm. Because the snowfall in the Cedar City storm was wet and occurred late in the spring season, it stuck to the leaves that were already growing from the trees, Hodges said. Preventing that kind of damage from happening is quite hard to do. Cindy Porr, from Phoenix, Ariz., said she was working a night shift at her job in Cedar City when the snowstorm began. By the end of her shift, most of the trees surrounding her work had broken because of the snow’s weight. The following morning, Porr said, she found a large tree at her rental home had broken and blocked off the majority of her driveway along with a portion of 800 West. “Luckily, the city came out and cleaned up the broken tree, so that was nice,” Porr said. Along with the larger tree at the front of her home, Porr said, two smaller trees in her backyard also broke. 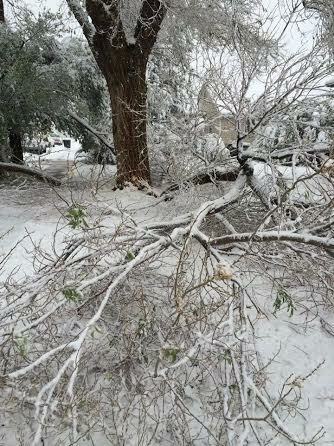 Should a similar storm happen in Cedar City again, one option to prevent damage would be to shake the snow off of the tree branches, Hodges said. However, constantly checking the snowfall can be difficult, especially if a person is asleep or has a larger tree that is harder to reach. “It can be hard to stop nature with things like this,” Hodges said. Some Southern Utah trees can also experienced what is called “frost crack,” Hodges said. This can happen where it is relatively warm during the daytime and trees begin the photosynthesis process. Then when there is a really cold night, water, sap and other compounds inside the tree freeze, causing the compounds to expand, Hodges said. When frost crack happens it can make a popping sound or even a loud crack that can sound similar to a gunshot. While most trees in the Cedar City area are not affected by extreme cold, there are some in the St. George that are, Hodges said. The trees primarily at risk are the Canary Island date palms along with the Mexican sand palms and their hybrids with the California sand palm. “The smart thing would be to make sure you don’t plant those trees,” Hodges said. Planting trees as close to the house as possible allows them to absorb some of the warmth from the home, Hodges said. Taking these steps to keep trees alive during the colder months will also help people save money because they will not need to buy new trees each year. You should also take precautions to keep your coconuts from freezing. Mark Hodges, it was without a doubt colder than the norms — by far last year, but I can reassure you that the high temps exceeded well above 9 degrees in STG, and the overnight lows were definitely not “well below zero” here in town. I personally researched last years crazy cold temps and the coldest days hovered just under freezing (32F) and the coldest night (official recorded reading) was one degree F. in the city, with some neighborhoods and the higher elevation airport recording -1 to -3 degrees F.
So to say we were well below zero makes you look very uneducated as NO palm trees in the valley or in So. Utah would have had a chance at survival at “well below zero”!! Tyler, thank you for your input; we were referring to Southern Utah overall, not just St. George specifically. Everybody relax and don’t give in to Mark’s overbearing “advice”. Anybody with a little common sense knows that if your palm trees survived the rare deep freeze of last winter (in which most palms around the area have flourished and are thriving today) then you surely can have the peace of mind that they will survive about any St George winter! Many did not survive last winter, in fact I”d guess it was up to 50%. I noticed less of them at the nurseries this year and none going in our house (Hurricane). There is a cheap blanket with velcro straps that goes around them. You can also use a warming spot light, if you can get close enough to the fronds. Either solution is much faster, cheaper and prettier than a poor dead palm. ooops….near our house, meaning our neighborhood. By the way , there are cheap hacks on the warming blanket idea all over google. The important thing seems to be to cover the base of the fronds (where they sprout) and to allow air circulation. Duct tape and any old non-absorbent, non-fiberglass, insulation with padding might be enough…bath towels in a sealed trash bag???? Classy. Kinda goes with the christmas lights in July. Best thing is to trim back the tree branches after the leaves fall. And why do people plant non-native trees here that will die in the freezing cold winter months?